Water jet cutting is complimentary to our laser cutting services. We always try to quote and cut parts using laser, however, when the material becomes too thick to laser cut, or if a heat process is not allowed (especially with aerospace customers), then we use the water jet. The Flow WMC2 machine we purchased has a dynamic cutting head with two orthogonal drives on the nozzle assembly, which compensates for cut edge taper. Prior to the introduction of this type of machine, all water jet machines either had a pronounced tapered cut edge or the feed rate was reduced to very slow speeds to compensate for taper. Aluminium exhibits perhaps the best cutting results of all materials on water jet machines. 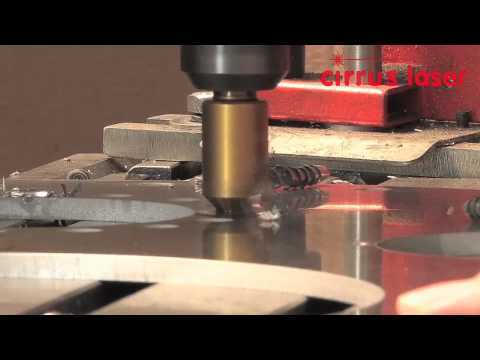 Most materials exhibit a very small burr on the cut edge, which in most cases necessitates only a small amount of mechanical de-burring at Cirrus Laser. With the ability to control cut edge taper our Flow machine has accuracy on holes, apertures and profiles approaching the levels obtained with conventional machine tools and EDM processes. Come and see our machines in action on a tour of the factory. This can be arranged by calling Mike Martyn on 01273 252 563 or you can contact us.